Thank you for these meal plans. I love them! I love this idea! This week was perfectly planned, delicious plus an easy shopping list. I wanted to print the calendar to post on my fridge but it wouldn’t print out clearly. Me too! I wish all the weekly meal plans came with the calendar! Hi GinaI am sorry that you even have to ask if people enjoy or take advantage of what the generosity that you provide–please don’t stop. You have changed lives. Its like being a mom –one minute you think your kids don’t care and in the next they say thank you…..
Love these mealplans! A small comment though: the two latest mealplans aren’t showing up under the ‘mealplan’ category. Thank you so much for making these! I’m following them exactly and I so appreciate you putting them together. They have helped me stick with my Weight Watchers goals. Thank you so much for these meal planners! This was my first time using one and it was incredibly helpful. I have been struggling to get back on track again since we brought my mother in law (vascular dementia) to live with us in the fall. It was one more thing on top of all of the new challenges we have been dealing with! This week went so much better for me and everyone (even MIL who is as picky as a toddler) loved the meals. And having the comprehensive grocery list included cut out the many visits to the grocery store that are typical of my week. BTW I was down 2.5 pounds this week at weigh in – first loss in awhile (instead of the steady gain I have been facing the last few months). That’s great Andrea!!! Keep it up!! Glad you find them so helpful! Keep sharing! This has been so helpful and I LOvE everything about it. Thank you!! Love these meal plans, it takes the guess work out for me trying to decide what to make for the week, plus my husband and I like any recipe of yours! Thank you!!! 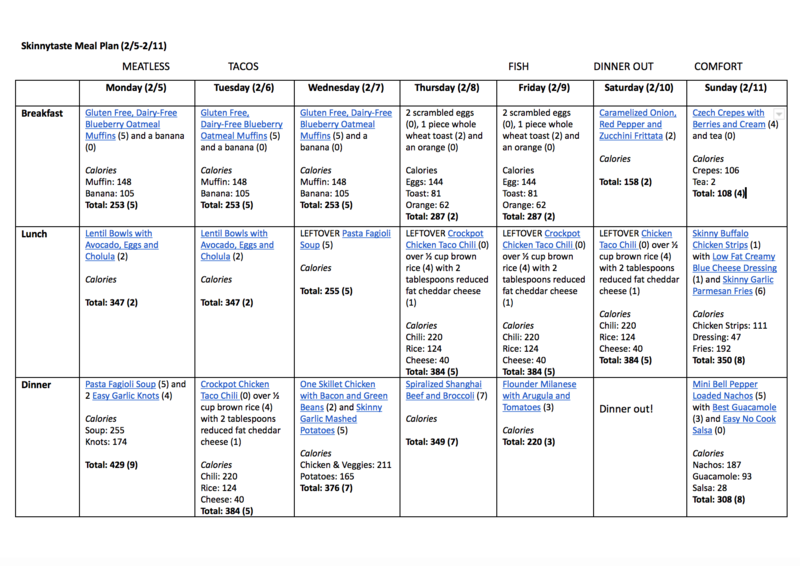 Love the meal plans – thanks for posting these along with the shopping list! This is my first week and it’s been great so far. Thank you for sharing! I just started cooking for my boyfriend and I and this is great! Is there anyway to print the weekly calendar along with the menu and grocery list? I love the idea of putting the calendar up so I can see at a glance what I’m going to have to eat that day. I did pin the calendar. Love the meal plans! Please keep them coming! Only one recipe out of the 3 weeks that we did not like. I so very much appreciate you for everything that you do! I’m not a meal planner, but it’s something I’m working to do, and I have all of yours saved. Please keep them coming! Yes please keep sharing the meal plans, although I do adjust here and there, they truly help in planning my week. Yes I love them! Don’t stop. Please continue to post these weekly menus, I love them, they inspire me to try new recipes!! I love these! It makes eating healthy easy and convenient. I hope you keep doing them! You are a life saver! As I embark in my cooking journey, this site saves me so much time and stress. So thankful Myleik Teele put me on to you. Thank you! Yes! Please keep them coming!! I never saw the detailed menu + shopping list. I’m IN LOVE!!! Yes please please please keep sharing this! You have to click on the continue reading link. I like the meal plans! They are great inspiration. I’ll admit I usually change it up, but I LOVE having a starting point! Please keep them coming! 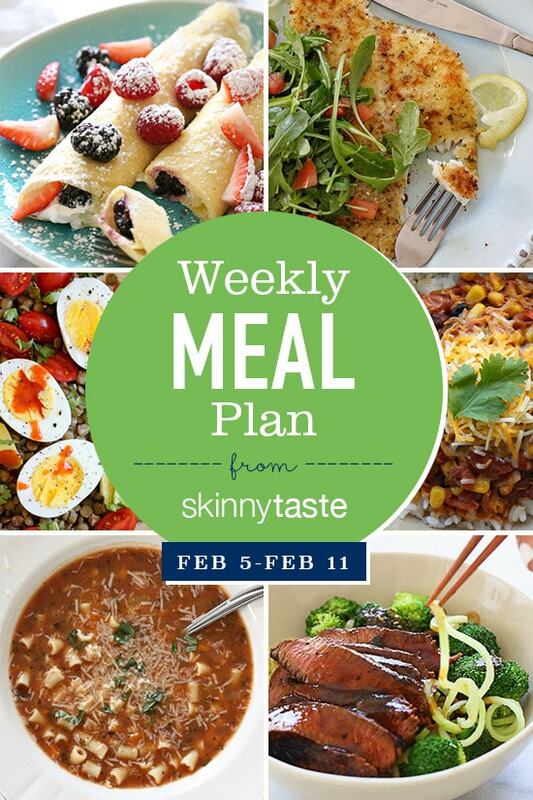 I absolutely love your site and the meal plans! People at work are always telling me that my food looks and smells delicious and I am constantly giving you credit! Thank you thank you thank you! Love the weekly recipe plans! Don’t stop! Thank you! I love having meals planned, the recipes and the new Weight Watchers points! The grocery list is valuable. Thanks!